One of my favourite breakfasts is the smoothie. Fruit, yogurt, milk, usually coconut, I feel like I’m on a tropical vacation! And I’ve been experimenting with green smoothies lately: adding a leaf or two (up to a cup or two) of dark, leafy greens to my fruit smoothies (not the milky ones). Green smoothies are excellent when trying to eat low on the glycemic index. Fruits like apples and pears are low-GI and match well with the greens, bringing their own flavour and sweetness without being overpowering. 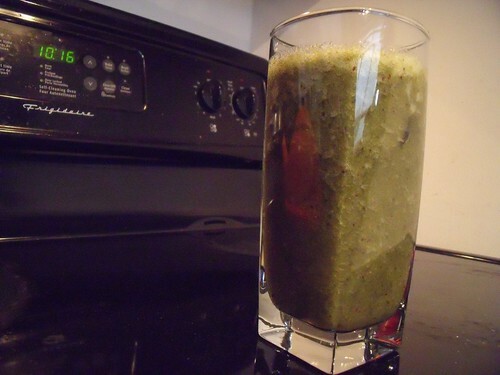 Meghan, the host of the 5 Days Low Glycemic Index challenge, has a great formula for green smoothies at her blog. 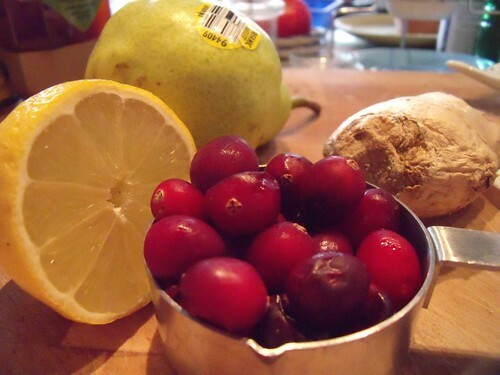 My smoothie combines so many of my favourite flavours: tart cranberries, juicy pears, and sharp ginger. I love it. The addition of kale makes it a green smoothie — if you are new to green smoothies, start by adding just a leaf and work your way up to adding more greens each time you make one. Once you’ve blended the smoothie, give it a taste. You may want to add a little sweetener of your choice (stevia is a good one if you’re going low-GI), but I like it just this way… And as I had to explain to the boyfriend: “it tastes better than it looks!” so give it a whirl! Combine all ingredients in a blender and blitz until as smooth as possible. 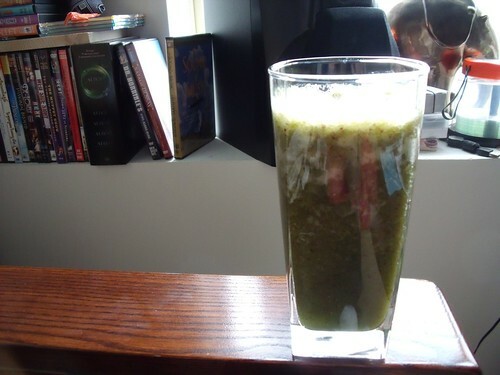 Serve over ice cubes & gloat a bit because you’re drinking a green smoothie.